Our Workplace engagement survey (WES) measures the degree to which your employees connect with their work and feel committed to the organisation and it’s goals. 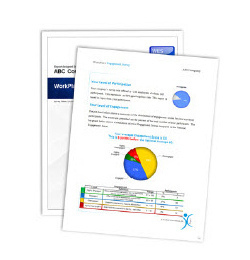 This gives you and your management teams a detailed view of what influences engagement across all your workforce segments and how your employees compare statistically to the overall working population. In addition the WES measures “satisfaction with employer” and “satisfaction with manager” across your entire organisation and gives recommendations for your organisation to improve. Are more focused on their work, rather than “watching the clock”. Give high levels of discretionary effort. Are emotionally involved with the company. Are mentally involved with the company. How does the workplace engagement survey work? The workplace engagement survey is delivered via the internet. An HR administrator simply forwards a link to the manager and his or her employees. The assessment does not need to be monitored, so the candidate can take it from any computer with internet access. All responses are completely anonymous. Information is aggregated in a centralized database and reports can be accesses by authorized people. We can assist you with the interpretation of the reports and help you and your managers create action plans for improvement. Disengaged employees are 53% less productive than their engaged counterparts. 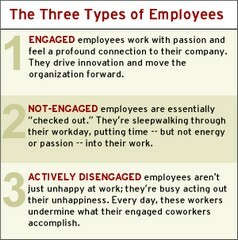 Disengaged employees are 24% more likely to stay at their current employer.